Now playing at the Music Box Theatre is Upstream Color, the second feature film from the enormously talented multi-hyphenate Shane Carruth (writer-director-actor-composer-editor, etc. ), and a masterpiece that I urge everyone to see on the big screen as soon as possible. Primer, Carruth’s inventive, complex, mind-bending low-fi/sci-fi debut from 2004, has garnered a huge cult following over the past decade and is widely referred to as the most “realistic” time-travel movie ever made. But I think Upstream Color, the long-awaited follow-up (which Carruth self-financed and is now audaciously self-distributing), is even better. It is just as bold in terms of ideas and narrative structure as Primer but it is also far more accomplished cinematically — fragmented close-ups, a super-shallow depth-of-field, zig-zagging editing rhythms and a use of heightened natural sounds all combine into an intoxicating stew where other masters of image and sound as diverse as Jean-Luc Godard, Robert Bresson, Alain Resnais, Andrei Tarkovsky, David Cronenberg, David Lynch and Terrence Malick are all valid reference points. I was originally scheduled to interview Carruth by phone yesterday but this was canceled at the last minute when his L.A. press junket ran behind schedule. So I’ve taken my notes and interview questions and converted them into this review. The plot of Upstream Color concerns a woman, Kris (Amy Seimetz), who works in digital animation, being kidnapped and drugged by a con-artist (Thiago Martins) who forces her to ingest a parasitic worm through a gas-mask-like apparatus. This allows the “Thief” — as the character is referred to in the credits — to use mind control to deplete both Kris’ bank account and her identity. Sometime later, she meets and embarks on a romance with Jeff (Carruth), a disgraced former financial broker who may have been subject to a similarly traumatic experience. Meanwhile, Kris also meets a pig farmer/sound recordist (Andrew Sensenig) — referred to in the credits as “The Sampler” — who performs surgery on her to remove the worm, which he then implants into one of his own pigs. As Kris and Jeff’s relationship evolves across a chronologically scrambled timeline, they discover that they have shared (false?) memories of the same childhood experiences and that they are just two of many damaged souls whose lives have been manipulated by the Thief and/or the Sampler. But Upstream Color is ultimately not a story-driven movie. It is a remarkably singular and wholly entrancing sensory experience in which the narrative elements serve as a starting point for Carruth to explore themes of love, loss, identity, consciousness and rebirth. I have no reservations about calling it American filmmaking at its most original and ambitious; or, to put it another way, this is the movie that I wanted The Tree of Life to be. I recently came across an interview with Stanley Kubrick (to whom Carruth has been favorably compared by more than a few critics), in which he said that he was never sure if story was the most important thing in a movie or if story was what allowed him to do all of the other things he really wanted to do. Carruth’s sympathies would seem to fall squarely on the latter end of Kubrick’s equation, as his exploitation of genre elements functions primarily as a fascinating pretext for him to explore various themes and ideas. Primer may outwardly appear to be a science-fiction head-scratcher but it is really more “about” the themes of ethics, friendship and betrayal that could ultimately be explored in any genre. My perspective on Upstream Color is that it starts off as an intellectual horror movie and then slowly and surprisingly transitions into a touching love story (though I fully admit that this perception might change upon further viewings). The opening of the film and all of the scenes with the Thief controlling Kris are disturbing to me personally because I don’t think there’s anything more terrifying than the idea of losing control of one’s own mind. But, after Kris meets Jeff, a kind of rebirth occurs for both characters, which leads to an ending that I feel is almost transcendental in its sense of uplift. Upstream Color is ultimately a much more emotional film than Primer (and may therefore be more accessible to general audiences), in large part because of the phenomenal, highly emotional lead performance of Amy Seimetz, for which Carruth’s debut has no equivalent. Upstream Color‘s most puzzling aspect, and the one most likely to send casual viewers heading for the exits mid-screening, is the subplot involving the Sampler. At first, I viewed this character as a kind of benevolent doppelganger to the Thief on the basis that he had removed the worm from Kris’ body. But the more scenes we see taking place on the farm, the more it seems like the Sampler is also controlling Kris’ and Jeff’s actions through the pigs — voodoo-doll style — since the animals have been implanted with parasites that were once inside of their human counterparts. The Sampler’s ambiguous, God-like status is increased by the fact that he is an artist — not only because he’s a musician and sound recordist but also because he’s a kind of puppetmaster to the main characters. (Is he meant to represent a film director?) In one of the film’s most enigmatic yet beautiful sequences, the Sampler throws a burlap sack full of dead piglets into a river. Their bodies decompose, eventually causing the color of the orchids on the riverbank nearby to change from white to blue. This scene is where the title of the movie comes from and may have in turn been inspired by a lyric from a White Stripes song (“You took a white orchid and turned it blue”). But the idea of rebirth is prominent in the film figuratively as well: Jeff and Kris forge a new collective identity, indeed become new people, when they become a couple and get married. As a happily married man of five years, I can relate. This entry was posted on Friday, April 12th, 2013 at 9:07 am	and tagged with Shane Carruth, Upstream Color and posted in Film Reviews. You can follow any responses to this entry through the RSS 2.0 feed. 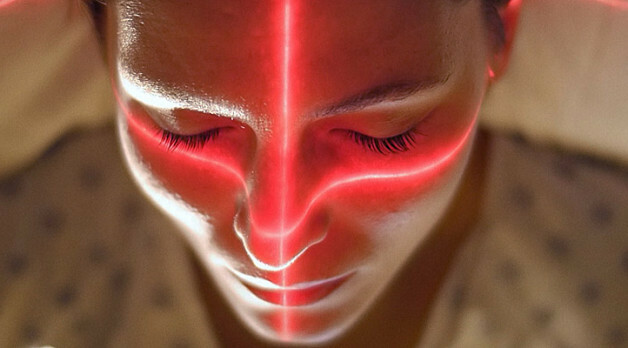 Upstream Color looks at the way we see ourselves in nature. The film involves placing Kris and Jeff under a microscope. The experiment begins when The Stranger grabs a trash bag out of a dumpster. A paper chain falls out of the bag. An then a man working in a greenhouse places creepy looking maggots in capsules that will be used in experiments genetically modifying human beings with pigs and pigs with human beings. The Thief appears and brainwashes Kris. He is a mythological figure that claims to be invisible since he is made up of the same material which illuminates the sun. Finally, Chris meets the Sampler she absorbs all of their conversations. She memorizes Walden—an autobiography of Thoreau’s experiences living in the natural world. The Sampler empties her vault box, steals her assets, and he then transfers bodily substances between her and a piglet and the piglet and her to establish a psychic link symbolizing the bonding of all living things. Latter on, Kris meets Jeff on a train; they share the same thoughts and fall in love at first sight; they remember having the same conversations years ago at different times with different people or with the same people or at different places. They bind each other’s wounds. Kris and Jeff’s experiences play out in perfect harmony. They are both obsessed with the upstream colors of orchids and have similar images of pigs in their subconscious minds. Orchids seem to have been around forever, and as do orchids, Kris and Jeff transcend time and place. Upstream Color has mythological and spiritual elements have been recorded in Neo-Platonism—a school of philosophy which appeared in the 3rd century C. E. It consists of an interpretation of Plato claiming the existence of a transcendent one which is good in itself. The idea states, “The process of creation is not so much as that the ‘One’ creates, but rather out of the ‘One’ emanated its own essence as the rest of the universe as a sequence of lesser beings.” In other words, if one sees any validity in this theory, “emanation should not be understood as natural processes in the sense of mechanical changes.” Therefore, the theme expressed in the film Upstream Color has been around for quite a long time. It may even be a part of human nature. Upstream color is so beautiful and captivating that any narrative ambiguity is completely acceptable. The cinematography and accompanying sounds are too powerful to put into words. It was such an experience that I personally did not want to discuss it. I wanted to selfishly hold on to this moving emotional experience and not taint it by sharing it. Shane Carruth is like a mysterious genius, letting the story unfold in bits and pieces that the viewer must piece together. He captures the raw emotion that is involved in relationships in marriage. One particularly haunting and beautiful scene shows a man and a woman fighting. She begs for him to accept her love and see it as real, wanting peace between them. However, the man dismisses her and we see this multiple times. We then see the heartbreaking image of her lying in a hospital bed with him at her side. He cannot communicate his regrets, his love, or his sorrows. It speaks to the human condition that we take people and our connections for granted, not knowing when they will be stolen from us. The sampler is appropriately named not only because he records music, but also because it connects him to the people who the thief stole from. He visits the victims he operated on and they are not able to see him. When Kris is listening with the headphones to the music that is when she connects to him. She looks him straight in the eye and seems to shoot him dead. Regardless of how he died, it is a turning point in the film. The sampler had a strange sense on control over the thief’s victims, and once the sampler is gone the group is freer. Since Kris’ story is the focus, we are able to see her journey and its beautiful ending. It was heartbreaking to learn she could not have children even when her paired up pig did. When the sampler was gone and they arrive back on the farm it seemed she was finally free. She cuddles a piglet as if it is her own baby. This film is confusing, abstract, yet one of the most poignant and moving films I have ever seen. The experience would have been much different with a bad sound system because the sounds and music in the score are so powerful. I would watch this film again and again, unveiling new meanings and reliving a powerful moment in a different way. Shane Carruth is an absolute genius. Upstream color was whacky yet brilliantly written. I was confused through out the film, but after the class discussion, I think I understood it. I agree with Mr. Smith and how he sees the beginning as horror film! It then turns on us and becomes a sick and twisted love story. Seeing the worms in the beginning was very vivid, kinda groose if yu ask me. This film made me loose my appetite! There was this one scene when Chris attacked the fridge because she was so hungry, then she passed out with food still around her mouth! Ew, I am just picturing it now! I loved the imagery, color and the sound! If it wasnt for the sound, the film wouldn’t has seemed or have been as intense and vibrant! Carruth kept doing flashbacks of these pigs, and close ups of pigs faces, creepy!! Carruth kept me on my toes, as confused as I was, I still wanted more! The pigs bothered me, I am a huge animal lover and seeing the baby pigs being thrown in a bag and drown to death made me really sad. This movie is a must see and has so many interpretations. What exactly is it about? Love? Marriage? Mental health? Pigs? Worms? You decide! Yesterday in class I said a very bold statement, which I still stand by: “This is the weirdest movie that I have seen”. Even though I have seen my fair share of experimental films, Upstream Color managed to beat all of them in terms of weirdness. The reason for this is because all of the “purely experimental” films I have seen had no plot to begin with, and the director’s intention was for you not to understand the film, but to experience the film. By experiencing the film and not paying attention and coming to a conclusion (even though it’s natural to use your brain to think and try to make sense of the film), the films, as strange it sounds, became less weird for me. Upstream Color was a film that was a mixture of an experimental film and a film that contained a story, and because of this it demanded an explanation, which lead to me being confused the entire time because I couldn’t just sit back and experience it. I know for most people it’s the other way around, but for me, puzzle films are much more stranger than purely experimental films (I promise that this explanation made a lot more sense in my head, sry). Many of my classmates mentioned that music was what made them emotional and was a key part of the film, which I loved to hear because even though film is a multimodal form of communication because it contains visual, auditory, and linguistic elements, I feel like in many films, the auditory (music) is subservient to the plot. In the case of Upstream Color, I thought that the plot was subservient to the audio. This reminded me a bit of an experimental film I saw by my homeboy Pip, where he took 5 minutes of footage from a Charlemagne concert and extended it to 22 minutes by extending the notes and added color to each note based on how we perceived it in our retinas. Upstream Color came across as a short film that, like Pip’s experimental film, was extended by music (ik Shane Carruth didn’t do this, but it came across to me like that). The feelings of the characters were grouped together by the music, such as the gorgeous montage sequence of the repeated images of Kris and Jeff looking at the birds flying in the purple sky in between scenes of Kris and Jeff finding out they have the same childhood memories (like their memories are repeated images?) and light piano music was played in the background (a contrast to the darker and creepier music played throughout the film). By repeating images and music, it, in turn not also extends the film, but extends our feelings toward the characters. Also, if The Sampler is meant to represent the director because he’s like the puppet master of the characters (I’m totally with you on that), then this would lead to an explanation of the root of the music. In the film, The Sampler used the pigs to “sample” the victims experiences, leading to his inspiration to record music, which could suggest that Carruth’s inspiration to record music stemmed from Kris and Jeff’s experiences as well and was inspired by their feelings. Ugh I feel too pretentious and rambly so I think I’ll end that there (sorry if I made literally no sense, but I straight up did not understand it and I think I need a second viewing). Upstream Color is an independent film that first premiered at the 2013 Sundance Film Festival. The talented Shane Carruth wrote, produced, and directed Upstream Color. I thought it was really cool that he did not have a typical film upbringing, I would’ve never imagined that the brilliant mind behind this film would have been someone who majored in math and is a software engineer. I can’t believe he is a self-taught filmmaker he really is talented and the cinematography in this film is proof Carruth pays attention to the smallest details. Financially Upstream Color was a huge success. Carruth helped achieve this by distributing the film himself. I definitely agree with Professor Smith that, “You don’t need a big budget for big ideas.” This film was very abstract yet it was shown in a simplistic way. The cinematography was spectacular in Upstream Color. I was really impressed the way it was filmed. It was visually beautiful I loved how the camera would focus on the center of the scene and everything in the background would become blurry. The images in the movie appeared so clear and vivid. 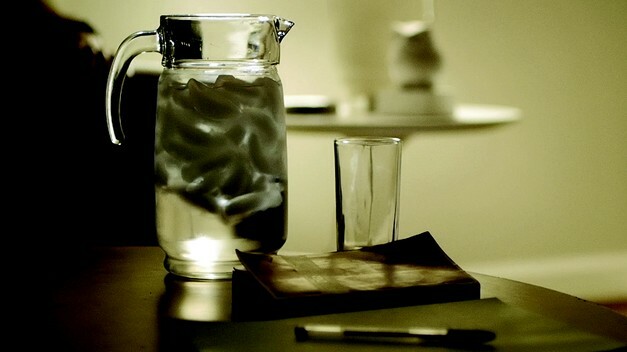 For example, the way the ice and water moved in the pitcher at the beginning of the film. Also when the worm slithered its way up into Kris’s arm and foot I got goosebumps from how realistic it looked. I was surprised when I found out the camera used for this film was not a super expensive one. This film is aesthetically amazing, it shows how much work Carruth put into it from editing it to the angles of the camera and the lighting. This film has definitely been one of the strangest films I have ever seen. I can see what Professor Smith meant when he said, “You think you know what’s going but you’re not sure.” I definitely felt like this while watching Upstream Color I feel like I understood some parts, but other parts I was off. During the discussion after the movie I found out that the pigs were somehow connected to the victims of thief. I didn’t realize that while watching the movie, but now I get why Kris and Jeff were hiding in the bathtub frightened. It’s unique the way Upstream Color transitioned into different genres such as horror, sci-fi, and a love story as the film went on. It was refreshing to see it transition into several genres. 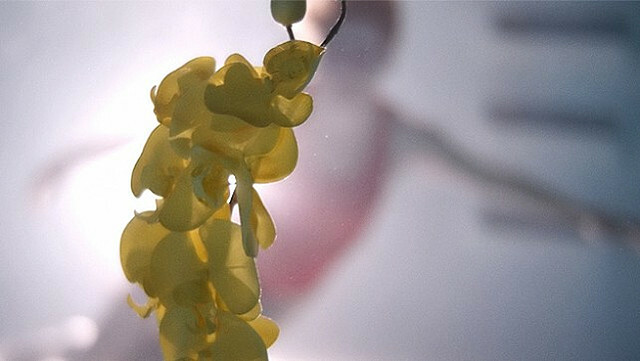 Upstream Color featured several themes of love, loss, identity, nature, and birth. Both Kris and Jeff experienced something traumatic that left them feeling lost and little memory of their identity. I feel that their experiences brought them closer and both helped each other heal and feel what love is again. I like the way the film ended with Kris cuddling the piglet it left a sense of hope that all the victims of the thief are trying to piece their lives back together. Even though this was an odd film the director, Shane Curruth is really gifted in filmmaking. Upstream color is an abstract movie where a women is kidnapped, forced to eat a worm which makes her get into a hypnotic state, where the man that made her drink it convinces her to empty her bank account and give him all the money. When he leaves after he gets the money she is still under the trance and when she wakes up we see the worm moving inside of her, she then tries to cut it out of her skin, just like anyone really would maybe, after she is unsuccessful she hears this noise in the distance that leads her to this doctors house where he preforms a surgery using one of his pigs. He transfers the worm to the pig and then Kris, the leading girl character, is out of the trance. That is the first 30 minutes of the movie, when things start to unravel, we notice that she wasn’t the only victim of this, and she is painfully scarred and never the same. She finds a man named Jeff who we later discover had the same mark on his ankle from where the doctor preformed the surgery on him as well, the fall in love and get married. They go through a number of things together where they hear these noises and it brings them back and triggers something in them. Kris thinks she pregnant, but when she goes to a real doctor, she tells her that it is literally impossible for her to get pregnant. At the same time it flashes to the doctors pig farm where u see the pig is pregnant; there is a connection between the pigs and each person he operated on. The bigger picture of this movie is that they are trying to overcome something together with the support of one another. Although I cannot connect I understand where people are coming from and see it. Some parts I was confused and was lost throughout the movie I still was trying to understand the main message, I think this movie is just either you love it because you connect with it right off the bat, or you just don’t understand it so u cant like it, or you just need to watch it again to fully understand it. I would watch it again to understand it more, but as of right now I was really lost on a couple things, but I feel like that’s the way I was supposed to be provided to me, and the fact that I didn’t understand it is just me needing to pay more attention and watch it again! At the end of the movie the doctor dies and they find this box full of all other information about the other victims, they then send it to everyone with a copy of a book so they too can have closure in the matter. It was an alright movie, Ill watch it again. The movie, Upstream Color, directed by Shane Carruth, 2013, was a surprise even after being warned ahead of viewing it. Though nothing like any movie I have recently seen, it did remind me of two other movies. The first movie was remembered when the main female character in Upstream Color was invaded by a worm that then messed up her mind and allowed the source of the worm, the Thief, to control her mind and her actions. This plot reminded me of a Star Trek Movie (Wrath of Kahn) where the bad guy forced his victim to consume a worm that damaged the victim’s brain and then allowed the victim to be controlled by the bad guy – the same plot as in Upstream Color. The second movie I was reminded of was memorable, though I do not remember the movie’s name. I saw the movie when I was very young, sometime in the late 1960’s. The memorable movie had a main female character who was given a psychedelic drug without her consent. The remembered movie was shot from her point of view, as was most of Upstream Color. Both movies used close shots, erratic cinematography, confused facial expressions and verbiage, and disjointed plot lines to communicate the main characters’ fears and confusion. Just as I found the Wrath of Kahn and the movie from the 1960’s memorable, I will find Upstream Color memorable. Most stories in film tend to always have a beginning, middle, and end. There tends to be a birth, a life, and some form of death rather it be physically or mentally. The best part about this flick is the realization that no one is in complete control and that finding oneself is the closest we can get to it. The film Upstream Color, directed and starring Shane Carruth (Jeff), is a beautifully illustrated film about identity as well as rebirth. Upstream Color stars Amy Seimetz (Kris) who is an animator that is one of many brainwashed and cheated by a by a thief. The thief (Thiago Martins) injects a chemical seemingly found in orchids into parasitic worms that he forces on his victims that allow him to exhaust everything from money to their memories. After Kris falls in love with and marries Shane Carruth (Jeff), they both discover their happenings do to the mixed recollections and sounds provided as a side effect of a surgery done by Andrew Sensenig (The Sampler) who doubles as a sound designer and farmer and apparently a experimentalist. The sampler would find these victims and lure them to his pig farm using sounds. He would then remove the parasitic worms and implant them in pigs that he would later die and decompose back into the water and into the orchids causing a cycle that would later be broken when Kris discovers and gathers all of the victims to care for the pigs after the Samplers death. The film was actually an honor to view as it moved other viewers in places that their minds would like to neglect. The facts that there is a scene where we see that both Kris and Jeff ere being controlled, expresses that in life we are all brainwashed to some degree and that love and patients is the grounding factor to remembering who we where and truly are. Upstream Color demonstrates a truth within each one of us and it’s beauty lies in the fact that it shows that through love, community, and self-identity that we can conquer anything in this vicious cycle of life. Carruth pulls all of this off with minimal dialogue and breathtaking imagery alluding to the fact that life goes on regardless of circumstances and that we are all connected no matter the character or roles we believe to be a part of. Never before have I watched a film all the way through thinking “this movie makes no sense” or “there better be an explanation to this.” Clearly, I thought the movie Upstream Color went way over my head and was too smart for me. As a result, I was zoning out and reflecting on my own life. I had no idea why though. That was until we had our post show discussion. As mentioned by a few classmates, some thought that this was a story about battling depression. And I couldn’t agree more. Instantly, the whole movie made sense. I found that my self-reflection throughout the film might have been my subconscious’ way of being able to connect with what I was watching. Depression, as I mentioned in class, is something I myself have dealt with and so many of the beautiful images in this film were so personally clear and understandable. For example, when the main character Kris (expertly played by Amy Seimetz) abruptly got up and started just walking down a street with no idea where she was going, I could connect to that because I have behaved erratically like that. I could connect to how Kris’ lover in the film, Jeff (played well by director/writer Shane Karruth), throws a tantrum and gets into a scuffle with a co-worker for no reason because I often have trouble and understanding my own emotions. I’m honestly amazed how personal and truthful of a film this was to me because of small moments that I could immediately understand and connect to that just hit so close to home, but in a good way of course. It was a film that ended on a hopeful note which of course, if you interpret this film to be about depression, is ALWAYS a good note to end on. The movie “Upstream color” is the most provocative and disturbing movie I have ever seen. I felt almost nauseated watching the scene where worms were moving inside of Kris’s body. The movie started like a horror film when the character Kris was tasered, kidnapped, and drugged with hypnotic substance made from worms. She lost her memory and completely fell under the influence of the Thief who hypnotized her and stole her saving money and a collection of coins. The whole movie felt like a puzzle to me. For example, some scenes were shown several times at different angels and some scenes did not logically connect to each other until the end of the movie where everything fell in the right place and started to make sense. In this movie everything was connected on some bizarre level: the Thief, Kris and Jeff, the Sampler, the pigs, and the blue orchids. The circle of life connected them all. Almost the whole movie was in a grayish and pastel color with contrast to bright colors in other scenes. Scenes that represented action inside of Kris’s body, underwater in the river, or blue orchids, were vividly bright. Music played throughout the movie nonstop. During the dialogs, the music would fade to a quieter, less intense sound, almost as though it was playing behind the screen. When the music stopped, other sound emerged, which sounded like music too, such as a noises of water or the blowing of the wind outside the city, printing copies, or working the sowing machine in the city. Upstream Color is a film that left the audience with so many themes to consider such as brainwashing, theft, the connections between people and the consequences of events that we may never see, as well as the idea of an outside observer and puppeteer of our life which can also be seen as a god-like figure. But even with all of these themes going on nearly simultaneously, this can leave its audience without words or just completely confused. If you have a lack of imagination, or trouble accepting a series of events that is very abstract this film is not for you. This film begins with some kids drinking this juice that came from specially grown maggots, from what we can tell. After they drink the juice they close their eyes and start doing the exact same hand movements. We are led to believe that these special maggots can alter the state of the mind in unexplainable ways. The man known to us as the thief takes two of these maggots and puts them into capsules to sell as drugs on the street. When he is unable to sell them he goes to a bar where he forces it down a woman’s throat and she immediately becomes hypnotized and completely susceptible to anything he says. The thief has her do a series of tasks such as make a paper chain and drink a certain amount of water so he knows that she is completely under his control. He then has her empty her bank accounts and the equity on her house. She wakes up the next morning not remembering a thing, but she can see something crawling under her skin. The character known as the Sampler is arguably the most interesting in this film. This man takes samples of sound found in nature and changes it in a way to make it a symphony of nature in a way. He plays these sounds on a set of speakers that are faced towards the ground and as we see worms start to crawl up from the ground we see the woman, Kris, walking up to this man’s truck in a zombie-like state. He performs a procedure on her where he cranks this worm that’s now many feet long out of her and into a pig. Throughout this movie we see the Sampler following Jeff and Kris around, but it’s as if he is in their mind and not actually with them. The Sampler is the closest character to a god that I have ever seen in a film. This is because he not only performs a good act of taking the worm out, but he can also be seen as more villainous when he cages some of the pigs, making Kris and Jeff agitated and afraid, or when he drowned the sack full of piglets which later created new life upstream. The death of the Sampler was a part of this film that was truly difficult to comprehend the first time around. We see the Sampler following Jeff in his office where there is only one seat. Then we see Kris walk up, and just as Jeff doesn’t acknowledge the Sampler he doesn’t seem to notice Kris. They are all sitting down when all of a sudden Kris makes eye contact with the Sampler and he then gets up and walks away, seemingly having some sort of trouble doing so. As he slides down the wall slowly Kris starts to shoot him several times as the scene changes back and forth from Jeff’s office to the Samplers pig farm. This may be the murder of the century because it may be hard to track a killer with only a telepathic connection to the victim. I found “Upstream Color” to be visually entertaining and beautiful to watch. The film had stunning cinematography and a magnificent musical score that was its own storyline throughout the film. However, the film was very allusive in regard to its ambiguous storyline, its mysterious and complex character studies and its themes of self- destruction, illness, imagery, symbolism, and trauma. The film focused on one woman’s descent into insanity, which was associated with the worm that somehow invaded her body. 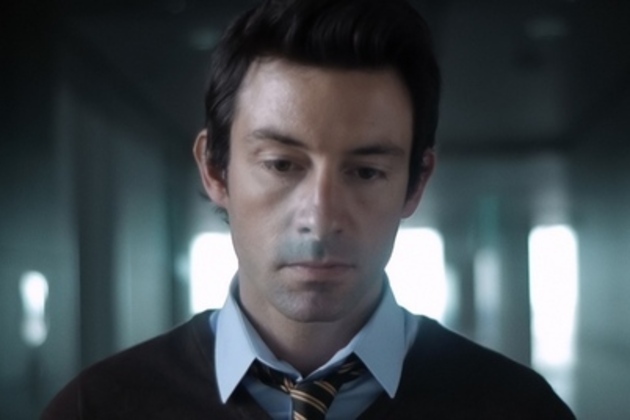 Shane Carruth implemented many images of one couple’s journey into slowly losing their minds. He did so by showing their depression, their delusional and psychosomatic fantasies of strange hallucinations they were experiencing. I also found that “Upstream Color” had some very complex and fascinating character studies. The character of Kris was probably one of the most fascinating characters I have ever seen in American cinema. It seemed as though she had multiple personalities. The performance given by Amy Seimetz as Kris was truly remarkable in every single aspect of word, acting. She was emotional, volatile, raw, unpredictable, vulnerable, uncertain, joyous, and lastly, completely irrational. She would sometimes incorporate all of these personality traits into one scene, which made the scene even more compelling to watch. It was an astonishing portrayal of a woman who was at the mercy of an ageless and living organism that would not leave her body. Her performance as the female protagonist, Kris, reminded me of Tatiana Maslany’s brilliant portrayal of a woman living with Dissociative Identity Disorder (D.I.D. ); otherwise known as having multiple personalities; on the hit Emmy- nominated TV show, “Orphan Black”. It reminded me of “Orphan Black” because this film exemplified a woman, who because of the organism living inside of her body became the living personification of somebody with multiple personalities. Her performance was encapsulating and enthralling because it had many facets of a woman on the brink of a nervous breakdown, which took the audience to strange and unpredictable places. Her performance also reminded me of Linda Blair’s performance as a teenage girl being possessed by the devil in “The Exorcist”. I saw some parallels between Linda Blair’s performance in “The Exorcist” and Amy Seimetz’s performance as the protagonist, Kris in this film because they both played women who were being controlled and micromanaged by non-living entities. The characters were similar because they were both completely powerless to control their behavior when these creatures possessed them. It was a master class in acting by Amy Seimetz, who was blindly unrecognized by the Academy of Motion Picture Arts and Sciences. What a shame! The film also included very powerful musical composition. The score of the film helped the story flow along smoothly from the beginning to the conclusion. As a result, the film was powerful and emotionally enticing to watch. The effective use of the brilliant musical score, helped the movie transition smoothly, gave the film an emotional resonance long after the audience left the theater. Each character in the film was given their own, musical score due to their different personalities. For example, the character of Kris had an emotionally powerful and vulnerable score due to her mental instability, fragile state of being and her vulnerable nature. The character of Kris’s husband, Jeff, played by Shane Carruth, the director, composer, editor and co-lead of the film, had a musical score that was mysterious and had a dark undertone to it, due to the aloofness and mysterious nature of his character. The character of Jeff was in some ways even more uncertain and unpredictable than the main character, Kris. The audience was left to interpret more about his character than they were about with Kris’s character. Jeff’s score did an excellent job at establishing how mysterious Jeff really was. The score was emotionally riveting and enticing to listen to which left the audience on the edge of their seats, anticipating what would happen next. As a result, the audience wanted to know more about these characters. Another facet of this film that was intriguing was the phenomenal cinematography. The cinematography was seen through the unexpected twists and turns of the storyline and its complete unpredictability. The cinematography had expert close-up shots of the insurmountable obstacles that the characters of Kris and Jeff were facing in the film. It made the audience actually feel as if they were experiencing the pain and suffering these two characters went through. I also thoroughly enjoyed the use of shallow focus in the film. I enjoyed the effective use of shallow focus in the film because when it was in use, it concentrated only on a specific character or space and nothing else. The cinematographer/ Director of Photography (D.P.) did a brilliant job at capturing each character’s individual pain by showing how they were suffering in their particular environment. I also liked the cinematography of the pigs and the close-up shots of the pigs having babies because of the symbolism behind it. The pigs being able to have babies in the film was a symbolic contrast to Kris’s infertility. It was an excellent use of symbolism that Shane Carruth contributed to the film that made the story even more compelling to watch. The cinematography of Jeff was also very impressive. Jeff was a kindred spirit to Kris in many ways. He had been kidnapped by the character of The Thief, drugged with a hypnotic drug, which contained the worm and had been placed under mind control by The Thief, as was Kris. He understood her and the trauma she had been experiencing in ways that no one else could understand. The cinematography of Jeff showed his reactions to what his wife was enduring and was brilliantly captured. Overall, the cinematography in the film was exceptional because it displayed the reactions of all of these characters from their perspective, and never lost focus on the main female protagonist. The editing in the film was also fantastic. The editing really captured the essence of Kris and the trauma she had to endure. The editing of the pigs running to The Sampler was also very effective because it showed the pig’s desperation for freedom, and how their ability to get pregnant was the cause of how Kris was rendered infertile. It also was effective because while Kris was unable to get pregnant, she was better off because the worms that were inside her and her husband could a growing fetus. The editing was intense and powerful because it displayed both species’ will to live. In conclusion, I thought the film was very enticing to watch. It was visually entertaining, had encapsulating performances and amazing cinematography. It kept me on the edge of my seat, only wanting more. It was an ambiguous, stunning piece of filmmaking done to perfection by the one and only, Shane Carruth. I would definitely recommend it to everybody I know. To be honest, I realized a few minutes into the film that I had actually already seen this and had just forgot the title. I feel like sometimes a movie is so interesting and captivating that I don’t even remember the title by the end of the film. However, the first time I started watching Upstream Color, I wasn’t able to finish it. So, it was nice to get the chance to see it again through the end. I never would have otherwise since I couldn’t remember the title. So, thanks professor! Any who, Upstream Color was much more than just a film for me. It was a poem, a concert, an art exhibit, and a time machine all in one. I say it was a time machine because not only did it bring me back to the first time I watched it, it brought me back to feelings I hadn’t felt in years that I had almost forgotten about. This film is so abstract, it could mean hundreds of different things for viewers. Even more than just the film’s meaning, but the meaning of the feelings the film created for me. This film reminded me of my earlier years coping with depression and the post traumatic stress I experienced after, well, something traumatic that I’m not going to put out there. The funny part about it is that in 2013 I was still struggling to cope with these issues when I first began watching Upstream Color. Watching it again, recently, under the influence of a whole new perspective, with my severe depressive disorder now in full remission, it was strange to dig up the old emotions I had when I first saw the film. Something about the ambient music caused an emotional time bomb deep within my mind to finally explode. For lack of a better word, it was beautiful. Now, I know some people cannot understand why the resurfacing of my memories of depression would somehow be a positive experience. I’d like to reference a cliche that I read on my coworker’s charm bracelet just yesterday, but I’m sure you’ve heard it before: it’s not about the destination, it’s about the journey. Even though this is super cliche, it has a stronger message than most cliches out there as far as I am concerned. I remembering trying so hard to understand the meaning of my existence and understanding the society I had no choice but to be a part of. I couldn’t understand the value of what everyone was telling me to do, which was to go to school five times a week. I didn’t care about the anatomy of a dead cat, I needed to find myself, not a dead cat’s kidney or liver. How could I focus on something so trivial compared to finding happiness? I remember listening to ambient music like the music in this film. There was something therapeutic about it. I remember driving north to some woods off of the expressway just to be alone, a human in nature; nature among other nature. The simplicity of just being alive and focusing purely on the moment and the sounds of nature was so helpful. The birds, the trees, the wind… they didn’t care about making money or getting good grades. They were just… there, living, and nothing else. I used to skip school and go to the lake, too, and look out at the water. When I looked out at the water, I felt undistracted by the world behind my back. It was in these moments that I was able to focus solely on my existence and feel happy to be existing. Eventually, after a lot of time and persistence, I was able to return to society and face it with a new understanding of myself and a desire to find my purpose in the society that surrounds me. I realized even later, that I wanted my purpose in society to be someone who helps others with their depression. It wasn’t until Kris looked the sampler in the face that she was able to combat him and end his control. For me, the sampler was a symbol of depression, or any other traumatic mental illness that takes control. You have to acknowledge the obstacle in order to overcome them, and that’s why I wanted to focus on my happiness instead of avoid the problem. I think remembering the journey I went through while coping with depression reminds me of how brave, strong, and just incredible I am for experiencing something so confusing, heartbreaking, and unavoidable and still coming out on top. I don’t care if someone thinks that’s a narcissistic statement, if you’ve ever experienced depression, you’ll understand why I feel so accomplished. And a film that aids to remember that… is beautiful.